Whether you are a certified geek for all things Japanese or have only had a passing glance at one or two different anime, chances are that you have come across Pocky before. Ever since it was originally invented by Glico in 1966, these chocolate biscuit sticks have gone from strength to strength, becoming not just one of the most popular sweet snacks in the country, but also a symbol of modern Japanese popular culture around the world. Originally only available in a chocolate flavour, Pocky sticks now come in a range of flavours (like strawberry, matcha, coffee, and almond), shapes (short and fat or long and thin), and sizes (half-size or giant), with new and interesting varieties being launched regularly. Pocky has become so popular that there is now an annual ‘Pocky and Pretz Day’ (Pretz being another biscuit stick snack by Glico), where people are invited to take part in Pocky-related events all around the country. To find out more about Japan’s favourite snack, continue reading below. Alternatively, browse japancentre.com’s Pocky section for one of the widest selections of Japanese Pocky UK-wide. Pocky chocolate was invented in 1966 by the confectionery manufacturer Glico. Originally going by another name, the name 'Pocky' comes from the Japanese onomatopoeic word pokkin, which represents the sound the sticks make when they are snapped in two. 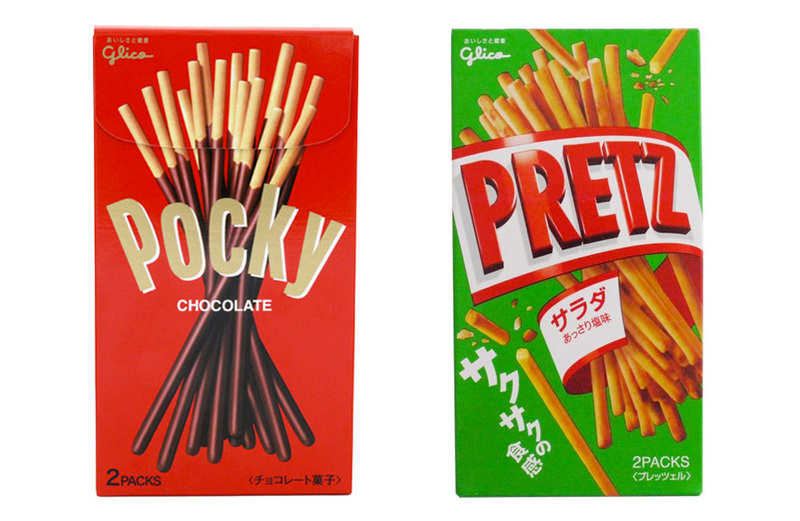 The original concept behind Glico Pocky Chocolate was to create a sweet version of snack biscuit treat Pretz, which Glico had launched three years earlier. Pocky sticks were originally going to be coated entirely in chocolate, but after realising that this would lead to a messy snacking experience, the inventors had the simple yet brilliant idea of leaving one end of each stick bare to serve as a handle. This feature made Pocky uniquely versatile as a chocolate snack, because consumers could easily eat it while doing other activities without worrying about making a mess. Pocky was enormously successful from the start, having made approximately 30 billion yen by 1968. It was only available in its original chocolate flavour at first, but as Pocky’s popularity increased, so did its product range. Almond Pocky was launched in 1971, and Strawberry Pocky made its first appearance in 1977. The product range now includes a variety of flavours and sizes. The core principle driving the Pocky brand is the idea of ‘Share(ing) Happiness’. To reflect that concept, all Pocky comes with plenty of Pocky sticks for sharing, arranged in compact boxes so the handles are at the top and can be easily plucked out. Pocky can be eaten for morning or afternoon tea, on the bus or train, while studying, watching TV, or reading your favourite manga. Pocky is, in short, the sweet biscuit treat perfect for enjoying any time. The original and, to many, the best, chocolate Pocky sticks consist of crisp, sweet biscuit sticks dipped in a layer of creamy chocolate, with one end left bare to serve as a handle. When most people think of Pocky, this is the product that first comes to mind. Launched in 1977, Strawberry Pocky is the third oldest variety of Pocky in existence. It is made up of crisp biscuit sticks dipped in pink, strawberry flavoured quasi-chocolate, and often there will be varieties where the chocolate has pieces of dried strawberry mixed in for a stronger fruity flavour. Almond Pocky originally started to be sold in 1971, making it the second oldest type of Pocky on the market. 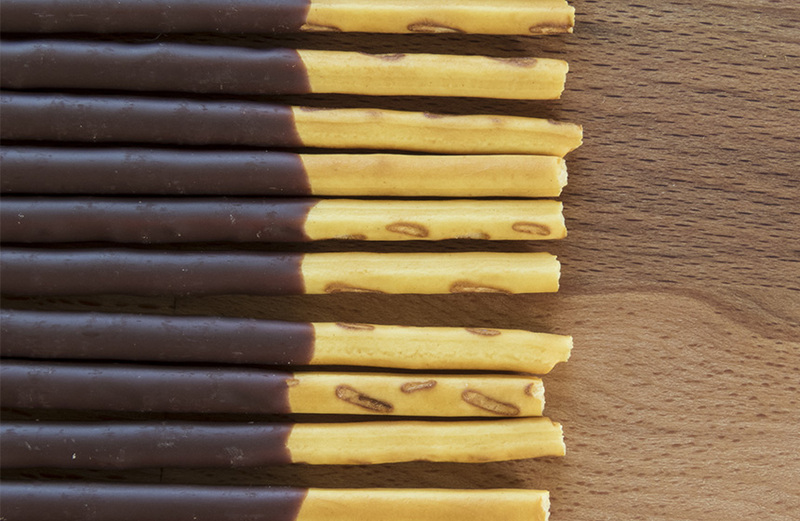 The chocolate that covers these biscuit sticks has crunchy almond pieces mixed into it, giving the Pocky more bulk and a more varied texture, plus a hint of savoury almond flavour. As one of the four most heavily used flavours for sweet confectioneries in Japan (the other three being the more standardised vanilla, chocolate, and strawberry), there is undoubtedly a high demand for matcha flavoured pocky sticks. These delicious sweet Pocky are a favourite among green tea lovers. Midi is a range of Pocky where the biscuit sticks are not as long, and the chocolate coating is much thicker. This gives them a short, chunky appearance that has earned them the Japanese name Potteri, meaning ‘short and fat’. These are a particularly tasty choice if you like thick chocolate coatings. Coming in chocolate and strawberry flavours, a Giant Pocky box is about the size of a small cereal box. All of the Pocky sticks inside are individually wrapped and measure approximately 21.5cm long. This Pocky is fantastic for sharing around at parties or social gatherings. There is no need for you to type 'Pocky sticks where to buy' into Google, because japancentre.com has all the Pocky you could possibly need. From classics like chocolate and strawberry to limited edition seasonal varieties, our Pocky section is where you will find the perfect Pocky for you. From the year 1999, on the 11th November, Glico launches an enormous mass marketing campaign to celebrate what they call Pocky & Pretz Day. Why the 11th November? Because when this date is written numerically (11.11), the numbers look like four Pocky or Pretz sticks. The reason why it began in 1999 was because this was the 11th year on Japan’s Heisei calendar, and that initial date (11.11.11) could be represented with six Pocky or Pretz sticks. Pocky & Pretz Day has become such an important event on the Japanese calendar that it is now certified as a legitimate memorial day by the Japan Anniversary Association. In true Japanese style, Glico goes all out on Pocky and Pretz day. Pocky-themed events and activities are launched all over the country for people to take part in, including carnival and arcade style games, competitions, quizzes, photo opportunities, and special ‘Pocky & Pretz Bars’ where Pocky and Pretz in all sorts of different flavours can be purchased. In some parts of the country there will be big, show-stopping, Pocky/Pretz themed events. One of the most notorious of these was the Pocky Pole Project of 2014, where skydivers were flown to 1,111m above sea level (keeping with the Pocky/Pretz theme of the number 1 being used as often as possible). The skydrivers jumped out of the helicopter, timing their jump so that they were 111m metres above sea level at 11:11am. At that point, they dropped huge Pocky sticks onto a giant target on the ground below them. Lastly, Pocky & Pretz Day has also taken to the Internet, so that people can participate regardless of where they are. On Pocky & Pretz Day 2012, Glico launched a Twitter campaign where they encouraged fans to Tweet the name ‘Pocky’ in an attempt to earn the Guinness World Record for ‘Most Mentions of a Brand Name on Twitter in 24 Hours’. They achieved their goal with 1,843,733 mentions. They then proceeded to break their own record in 2013 with 3,710,044 mentions, and Glico has held that record ever since.